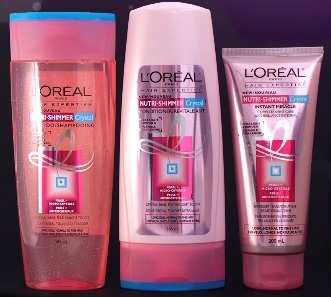 L'Oréal Hair Expertise Nutri-Shimmer Crystal haircare line gives life to lacklustre long hair! L'Oréal Hair Expertise Nutri-Shimmer Crystal haircare line livens up lifeless locks to offer bounce softness and shine to hair that really needs it. It nourishes and strengthens long, normal-to-fine hair while the micro-crystal and pearl enriched formula captures light to your hair and sends it back in multiple reflections for a superb crystal shine right through to the ends. Nutri-Shimmer Crystal Shampoo - 385ml - $5.99 - with a silicone free formula enriched with protein to nourish the hair fibre with moisture while leaving it feeling soft and light. Nutri-Shimmer Crystal Conditioner - 385ml - $5.99 - with an ultra light formula enriched with protein to nourish the hair fibre with moisture while leaving it feeling soft and light. Nutri-Shimmer Crystal Instant Miracle - 200ml - $6.99 - nourishes hair with no heaviness as it instantly penetrates the hair fibre providing hydrating nutrition while the pearl and micro-crystals captures light to add shine to the hair. Hair looks and feels softer and smoother with breathtaking shine.